Throughout the Spring Term our topic has been 'Pitter Patter Puddle Play'. This topic has seen us exploring in the outdoors and looking at puddles. We have also painted our own versions of Monet's Water Lilies, printed using bubbles, investigated and explored floating and sinking, performed dances, written using water, counted wellies and puddles and made water sounds using musical instruments. For our St David's Day Eisteddfod we performed Singing in the Rain in Welsh and throughout our topic we have definitely found out that 'Mae glaw yn fendigedig!'. During the Spring Term, we celebrated Chinese New Year. We tasted noodles and rice, performed a dragon dance, wrote our names in Chinese and made dragon masks. We celebrated our annual Wythnos Cymraeg by finding out more about Swansea. We made collages of famous people from Swansea including Alun Wyn Jones, Dylan Thomas and Catherine Zeta-Jones. 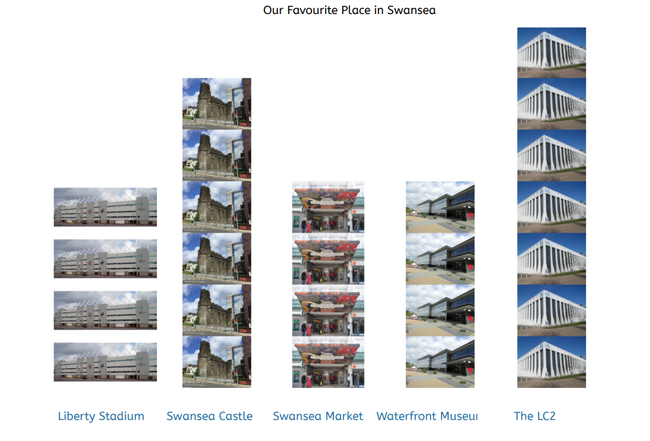 We made a pictogram using Jit 5 to find out which is our favourite place in Swansea. We wrote about Swansea using our senses and sorted photographs of landmarks from Swansea and not Swansea. Gwaith ardderchog Meithrin!